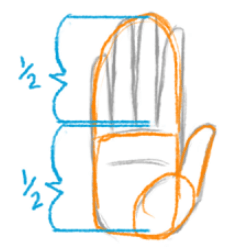 Hey there everyone, here’s a pretty… handy tutorial about drawing hands shared by thebluemario in the chat. Mind you, I think beginners should start learning to draw hands through blind contour drawing (drawing without looking at the paper/screen) until you get over the fear of drawing hands (I know I had that), then moving on contour drawing (you can look now, but most of the time should be spent looking at the hand), and finally sketching (if we ignore light, shadows, and coloring). The best reference is still using your own hands. A mirror or camera is also useful! Aim to draw them first through observation before using pictures so you’ll get better faster. Hands will be tricky to draw for a long time, might as well get used to drawing them. You don’t actually need to know all the details about the anatomy of your hand like the bones and muscles, just concentrate on what you see when looking at your hand. Unless of course your character is a skeleton or muscle monster or something. Men’s hands are usually more than half the length of the face, about 3/4 starting from the chin to the top of the head. While women are slightly shorter. People do have different finger lengths (i.e. longer ring finger, etc.). I suggest just using your own hand for reference to make things easier. 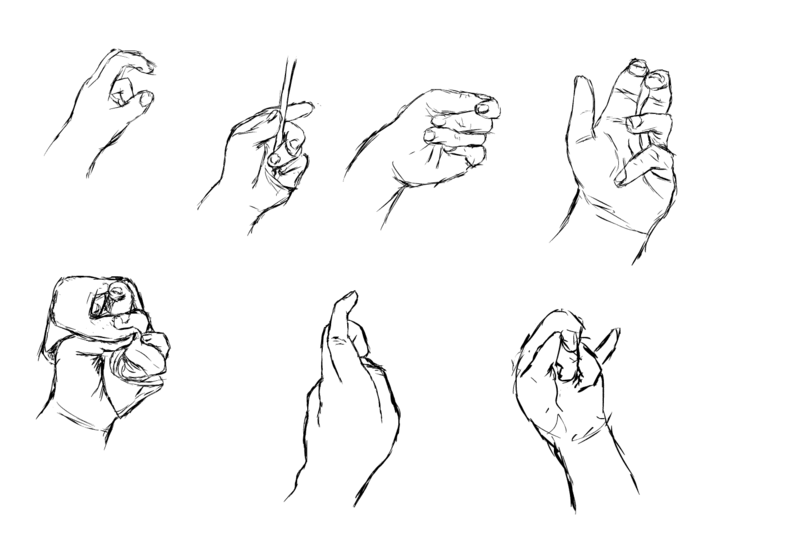 Make hands look rougher by drawing in more detail, and vice versa. I agree with the common gestures below, but you should also try to draw your hands in weird poses and different angles. You won’t draw them that much in reality, but you’ll get even better at drawing hands as a result. I think it’s important to feel your hand using your other hand. Take note of the muscles and bones as you touch them. And you might as well give yourself a massage while you’re at it! If you keep relying on tracing, hiding hands in pockets, or not drawing them at all, you’re only hurting yourself in the long run. There’s no getting around the fact that hands are important! If you have some idle time, like if you’re commuting on the train or bus, you could spend it time observing your hands and “drawing” it using your mind. It helps to quiet your internal voice/thoughts (thinking in words), and instead think visually while drawing in general. I don’t know the proper term for it… wrist joint? Whatever it is, don’t forget to draw that bump of bone near your wrist.